Travers was a chorister at the Chapel Royal under John Goldwin, was taught by Pepusch, and was apprenticed to Maurice Greene. He held the post of Organist at the Chapel Royal from 1737 until his death. 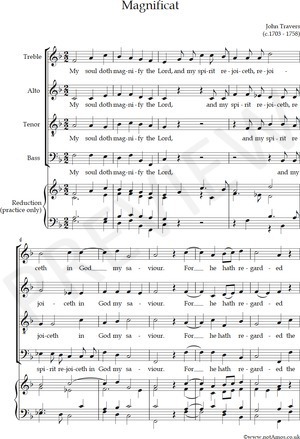 This service was first printed in Arnold's "Cathedral Music", and remained one of the most popular staples in Victorian cathedrals' repertoire. For he hath regarded: the lowliness of his handmaiden. For behold, from henceforth: all generations shall call me blessed. He remembering his mercy hath helped his servant Israel: as he promised to our forefather, Abraham and his seed, for ever. Lord, now lettest thou thy servant depart in peace: according to thy word. To be a light to lighten the Gentiles: and to be the glory of thy people Israel.